On July 24 the speaker of the Ukrainian parliament Oleksandr Turchynov announced the disbanding of the parliamentary group of the Communist Party of Ukraine (CPU) over a ridiculous technicality. The court trial over CPU’s ban as a political party started the same day with the next session of the court scheduled for mid-August. The CPU is accused of supporting ‘terrorism’ and the separatism of Eastern Ukrainian pro-Russian rebels. While Ukrainian and international left should not have any illusions about the CPU just because of the “communist” word in its name, nevertheless, we should worry and actively oppose its ban pushed forward in the context of a major anti-democratic assault after the president Yanukovych has been toppled down. First of all, let me explain the political nature and position of the Communist Party of Ukraine. The CPU was revived in 1993 after its ban immediately following the failed attempt of the coup in the USSR in August 1991. Quickly it became the most popular party in Ukrainian politics and together with other left-wing Communist-successor parties gained over 40% of seats in Ukrainian parliament after the 1994 elections. It played a role of political representation of a wider popular opposition to the consequences of neoliberal reforms of the 1990s proceeding with privatization, deregulation and commercialization while gradually destructing the Soviet welfare state and lowering living standards. By 2014 the CPU had lost its former support together with its, if somewhat old-fashioned, but still leftist position. Today’s CPU is a reactionary, bourgeois, culturally conservative, Russian nationalist party. It is not a communist party at all and it can be considered as a left party only by tradition or genealogy. For many years it used to be interested more in culture wars around identity, language, politics of memory, geopolitical orientation, even church schisms than in social-class issues or contact with organized labor. No one among Ukrainian left considers it leftist party. It could be defended as ‘the only left parliamentary party’ only by those who tried to prevent emergence of a genuine left party following a twisted sectarian logic. Sometimes the CPU was obscurantist and clerical even allowing publishing overly racist articles in the official party press. It used to sell the top party electoral list positions to the grand bourgeoisie. The richest woman in the parliament (a multimillionaire Oksana Kaletnik) was a member of the Communist group. The CPU unanimously voted for the infamous repressive laws rushed through the parliament by Yanukovych on January 16 2014 when not even all of the MPs of the Party of Regions (the then-ruling pro-presidential party) voted for them. But now the CPU is being banned not for being a reactionary, bourgeois, culturally conservative party but for voicing opposition to the new post-Maidan government. It is true that some local cells participated in the anti-Maidan movement in an organized way, and it is possible that individual members even participated in armed separatist militia groups (such a possibility exists for the members of any other party especially if they were on the pay-roll of that party or had maintained just a paper membership common for major Ukrainian parties, which are typically little more than electoral machines). At the same time, the CPU leadership is unequivocally supporting ‘united Ukraine’. The allegations against the CPU voiced by the Ministry of Justice officials include, for example, statements like the following: “[individual CPU representatives] overtly expressed negative attitudes to the actions of our military in Eastern Ukraine”. If interpreted literally, such accusations amount to plain and simple attack on the freedom of speech. A large share of Ukrainians are expressing now overtly negative attitudes to the so-called ‘Anti-terrorist operation’, which leads to large-scale destruction of the infrastructure, daily killings of civilians, and a humanitarian catastrophe in Donbass. Should they be punished for this justified criticism? The ban of the CPU will push the people of the Donbass region (and not only CPU voters) even further away from Kiev government. It will radicalize the committed rank-and-file CPU members who will have even more motivation to join the separatist movement. It will further discredit the Kiev government among the progressive international public. Is this an act of extreme political idiotism? It might be. More likely this is just another step in the general strategy of increasing chauvinist hysteria while criminalizing not only political but also social-economic opposition in Ukraine. Recently top Ukrainian officials such as prime-minister Arseniy Yatseniuk or National Security and Defense Secretary Andriy Parubiy called the expected social protests against the austerity policies of the new government a provocation by Russian agents. Ukrainian media are heavily involved in a reciprocal information war against Russian propaganda, attacking those human rights activists and independent journalists who criticize Ukrainian government and military as pro-Russian. 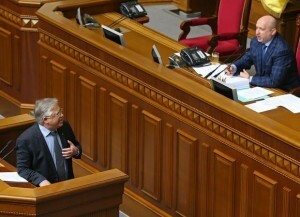 Serhiy Kvit, the new Minister of Education, called for sacking higher school lecturers for ‘amoral deeds’ connecting them to anti-government political positions. Arsen Avakov, the Minister of Interior, suggested introducing severe punishment for ‘terrorism’ and any form of attack on Ukrainian territorial integrity, including calls for ‘separatism’ – something undefined in Ukrainian legislature. Some would see these repressive sanctions and propaganda hysteria as necessary or at least logical steps for the state in a country with on-going civil war fuelled by a stronger foreign power. But even leaving aside the question of the class nature of the new Ukrainian government and the necessity to support it by any means at all, a more careful look at its recent repressive moves and rhetoric shows that the restrictive measures against the freedom of speech and political activity are starting to exceed what might be justifiable even considering the de facto war situation. The CPU case seems to be only a part of this anti-democratic assault comparable to the repressive laws the Yanukovich regime passed in January and in some aspects even exceeding them. No other Ukrainian government since 1991 has ever attempted to ban a major opposition party. Some people see this ban as the opportunity to open a niche for the new genuine left party. Unfortunately, these hopes are futile. If the war in Eastern Ukraine continues much longer or ends not with some peaceful negotiated solution but with the definite military victory of the Ukrainian forces, the much stronger and consolidated government would allow only marginal leftist activity in the country. Of course, it might not necessarily oppose some ‘soft-left’ Euro-style activism for liberal-left values but as its recent attempts to discredit social-economic protests show, it would hardly allow anything really dangerous for the neoliberal oligarchic rule. The banning of the CPU will be only the first step in outlawing most forms genuine, peaceful opposition in Ukraine. Therefore, we must actively oppose this anti-democratic attack on political freedom by the even more reactionary, bourgeois, conservative and nationalist forces. I disagree. Far from being the tribune of the people the Ukraine CP is a Russian fifth column intent on helping the imperial mater to maintain its grip over the economy and life of Ukraine. In this situation of war it is hardly surprising that it has been banned. The Ukraine army must push home its offensive on the pro-Russian ethnic cleansing fascist militias and liberate the people of Donetks from their arbitray, vicious rule. East and West must be unified under a revolutionary democracy that confronts gangster capitalism whichever imperialism it looks to for support. Banning the Ukrainian CP is a poison against freedom of expression and organisation ; it will act against the freedom of expression of any other party or current expressing criticism to the Kiev government’s policy, the ATO in particular ; such criticisms are needed needed also to defeat separatism on the point of view of the social and physical protection/mobilization of (and dialogue with) the local Ukrainian populations. And such criticisms even coming from defenders of a unified Ukraine will be stigmatized as “separatist” and “pro-Russia” – while they are conditions for the marginalization of the reactionary Great Russians. The binarian presentation of the war – either an external agression OR a civil war – is fake and counterproductive ; and the more you reduce the conflict to an external agression, the more you identify internal criticisms to “external agression” (5th colum ? ), the more you will destroy any chance to consolidate a popular Ukrainian unity. You don’t need to support the Ukrainian CP to oppose such banning. But you must be free enough to express in your own way criticisms – not fearing to use words (criticism of the Kiev gvt) that the UCP has used, but giving them a real logics of democratic opposition to all imperialist and anti-social policies – be it from Moscow or a West-oriented Kiev’s gvt.